What is the history of Chagas disease? What are the risk factors for Chagas disease? What are symptoms and signs of Chagas disease? How do health care professionals diagnose Chagas disease? What types of physicians treat Chagas disease? Can transmission of Chagas disease be prevented with a vaccine? What is the prognosis for Chagas disease? What are the complications of Chagas disease? What research is being done for Chagas disease? Chagas disease is an infection caused by a protozoan parasite (Trypanosoma cruzi) that can result in acute inflammatory skin changes (chagomas) and may eventually cause infection and inflammation of many other body tissues, especially those of the heart and intestinal tract. Chagas disease was first described in 1909 in Brazil. Chagas disease is caused by a protozoan parasite named Trypanosoma cruzi that is transmitted to humans from the feces of triatomine bugs (kissing bugs). Chagas disease is not considered contagious from person to person. The parasites usually enter the mammalian (human) host through the bug bite, or breaks in the skin or conjunctiva, replicate in mammalian cells, and may eventually reach other organs through the blood. Chagas disease may proceed through three phases in an individual: acute, intermediate or indeterminate, and chronic. Chagas disease symptoms vary widely from no symptoms to severe in the chronic phase. Acute-phase symptoms of Chagas disease may be swelling and/or redness at the skin infection site (termed chagoma), rash, swollen lymph nodes, fever, head and body aches, fatigue, nausea, vomiting and/or diarrhea, liver and/or spleen enlargement, and the Romaña sign. Chronic-phase symptoms and signs of Chagas disease may be irregular heartbeats, EKG changes, palpitations, fainting (syncope), cardiomyopathy, congestive heart failure, shortness of breath (dyspnea), emphysema, stroke, sudden death, chronic abdominal pain, chronic constipation, dilated colon, and difficulty swallowing. Patient history, physical exam, direct microscopic visualization of the parasites, and detection of antibodies against the parasites are methods used to diagnose Chagas disease. Treatment with antiparasitic drugs benznidazole (Rochagan, Ragonil) and nifurtimox (Lampit) kill or inhibit T. cruzi parasites; drugs are available from the CDC. Chronic-phase patients are usually treated using treatments directed at the specific symptoms or organ damage. Physicians such as cardiologists, gastroenterologists, transplant surgeons, and infectious-disease specialists may be members of a patient's treatment team. There is no vaccine against Chagas disease parasites for humans, but many experts suggest that elimination of primitive housing in rural areas and increasing education about the disease may prevent most cases of Chagas disease; insecticides and insect repellants may also help prevent Chagas disease. 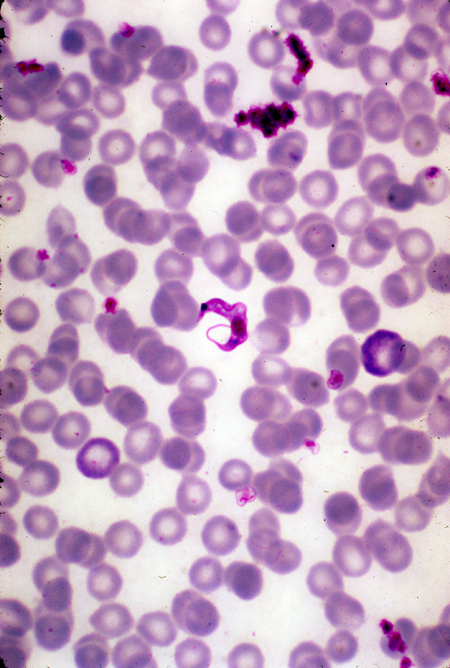 Chagas disease (also termed American trypanosomiasis) is an infection caused by a protozoan parasite (Trypanosoma cruzi) that can result in acute inflammatory skin changes (chagomas) and eventually may cause infection and inflammation of many other body tissues, especially those of the heart and intestinal tract. The disease was named after Dr. Carlos Chagas, who discovered the disease in 1909. The disease may have three phases in an individual: acute, with mild or no symptoms that may last weeks to about two months; intermediate or indeterminate phase that has few if any symptoms and may last 10-20 years or longer; and chronic phase that appears after about 20 years, with the more severe symptoms appearing from gradual chronic organ damage (especially to the heart and intestine, although other organs may be affected) with symptoms that usually remain for life. People with Chagas disease seen in the U.S. usually have acquired it while living in a country where the disease is endemic (Mexico and Central and South America). It is a tropical disease. The U.S. Centers for Disease Control and Prevention (CDC) estimates about 8-11 million people are infected in countries where the disease is endemic. The parasites are transferred to humans by the bite of blood-sucking triatomine bugs in the subfamily Triatominae, also termed "kissing bugs." The disease has been diagnosed in the U.S., mainly in immigrants from South and Central America. Triatomine bugs have been detected in Texas, and recently the CDC communicated that the bugs have now been found in 28 states, including California and Pennsylvania. American trypanosomiasis (Chagas disease) is distinguished from African trypanosomiasis (sleeping sickness or African sleeping sickness) by the part of the world where they occur, their vectors, and their different symptoms and different treatments (see Table 1). Chagas disease was named after Dr. Carlos Chagas, who first described the parasite Trypanosoma cruzi in infected humans in 1909 while working for the Oswaldo Cruz Institute in Brazil. 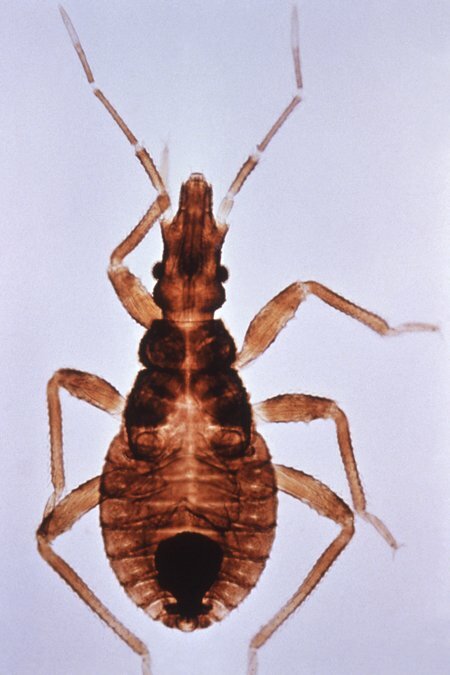 Chagas discovered that the parasites are transmitted to humans by entering breaks in the skin after they are deposited on the skin in insect feces. Chagas was the first scientist to discover all aspects of a new infectious disease: its pathogen (T. cruzi), main insect vector (Triatominae, Triatoma genus, or kissing bugs), hosts (humans, mammals), clinical manifestations, and epidemiology. The parasite species was named cruzi to honor his employer and scientific mentor, Oswaldo Cruz. Chagas disease is also known as American trypanosomiasis because it mainly occurs in the Americas where the triatomine insects (kissing bugs) usually are found. These bugs and the mammals they infect range from states along the U.S. border with Mexico through Central America to the South American countries (for example, Argentina, Bolivia), where the disease is endemic. Almost all cases diagnosed in the U.S. are in immigrants from other countries in the Americas. The vector-borne disease is fairly common in Central and South America, with an estimated 7.7-15 million infected people worldwide. Children have more acute-phase symptoms than adults. Fortunately, vector-control programs are working as prevalence rates are dropping in Brazil and other countries that have implemented these programs. However, because of warming climate trends, some researchers predict that Chagas disease will become more prevalent in the U.S. This is predicted because the vectors that carry the parasites are being found more often in non-endemic areas like the U.S., especially in the southern and middle states. The bugs that transmit the parasite have been detected in 28 states in the U.S. and are likely to spread to others. Chagas disease is caused by a protozoan parasite named Trypanosoma cruzi. Infection of humans occurs when an insect vector (mainly Triatominae or kissing bugs, a subfamily of the family Reduviidae and sometimes referred to as reduviid bugs) deposits feces that contains the parasites on human skin. The parasites then enter the mammalian (human) host through the bug bite, or breaks in the skin or conjunctiva. Occasionally, the parasites enter through mucosal cells of the mouth or airway when ingested or inhaled. The bugs often bite and/or deposit feces near the eyes and lips; when the parasites enter the skin, swelling and redness (termed a chagoma) often develop. The term kissing bugs comes from the appearance of these symptoms that resemble skin changes that occur with prolonged kissing (hickies). In some individuals, the parasites eventually go into the bloodstream and lodge in various organs, especially the muscular structure of the organs. The parasites multiply and eventually cause chronic symptoms related to the particular involved organ or organs that can include life-threatening cardiac failure, arrhythmias, poor gastrointestinal motility, meningoencephalitis, or death. Humans who live in poor or primitive housing conditions that border or invade the habitats of Triatominae bugs cause a break in the normal life cycle of the insect vectors (bugs) and their usual hosts (over 100 types of animals), termed the sylvatic cycle. The bugs then enter the world of humans and their domesticated animals (cats, dogs) and transmit T. cruzi to them. When T. cruzi is transmitted from bugs to humans or human pets and back to the bugs, the life cycle is referred to as the domiciliary cycle. The life cycle of T. cruzi is complex; it has multiple developmental stages in both the insect vector (Triatominae bugs, also termed triatomine bugs) and mammalian (human and animal) hosts. The figure below from the CDC shows the developmental stages that occur in both the sylvatic and domiciliary cycles. Chagas disease is not considered contagious from person to person; the parasite almost always requires a vector like the triatomine bug to transfer the parasite (T. cruzi) to humans. However, T. cruzi has been reported to be transferred to humans from blood transfusions, organ transplantation, from mother to infant through the placenta (congenital transmission), by ingestion, inhalation, and by laboratory accidents. Fortunately, these forms of transmission occur very infrequently. Researchers have demonstrated that in experimental conditions, bedbugs may become infected with T. cruzi from infected mice and then are able to reinfect mice, but human infection by bedbugs has not been documented to date. Not all triatomine bugs are infected with T. cruzi, and not every bite of the vector bug will cause infection; the transfer of the parasite from the bug to humans is not very efficient so getting the disease "is not easy," according to the CDC. Living in an area where the vectors (kissing bugs) that spread the disease are plentiful is a major risk factor for Chagas disease. Such areas are impoverished areas in Mexico and Central and South America. Any residence that is infested with these vectors is a high-risk area; eliminating the areas where the vectors reside reduces the risk. Another risk factor is obtaining a blood transfusion, especially in an endemic region, if the blood donors are not screened for Chagas disease. This risk also occurs for recipients of donated organs. Immunocompromised patients have a higher risk for development of the disease, and some infected women with chronic Chagas (as many as 10%) may transmit the parasites to their newborns (congenital Chagas disease). Also, eating unwashed foods that are contaminated with feces from the infected bugs may cause Chagas disease (food-borne disease). Most individuals who get the above acute-phase symptoms have them resolve spontaneously in about three to eight weeks. Occasionally, acute infections show chronic symptoms (listed below) if the patient's immune function is weakened. Most investigators suggest that the intermediate or indeterminate phase has no symptoms (symptom-free people). This stage may last throughout the person's life, and the individuals may never know they have Chagas disease, especially if they had mild or no symptoms in the acute phase. However, this symptom-free stage may only last about 10-20 years in some patients before the chronic symptoms develop in about 10%-30% of those infected. Some researchers compare the chronic phase of Chagas disease to HIV/AIDS. Whereas HIV/AIDS slowly attacks the immune system, Chagas disease slowly attacks the heart and the tissues of the gastrointestinal tract. Other investigators consider such a comparison as unwarranted publicity or hype to spotlight Chagas disease. These symptoms are due to organ damage caused by the persistent presence of the parasites within the tissues of these organs. Chronic inflammation develops as the body reacts to the parasites; it affects the nerve cells or neurons in these tissues, causing electrical conduction changes in the heart (arrhythmias) and poor muscle tone in the intestines. Unless the person lives in an area where the chagomas associated with Chagas disease are well recognized, the acute phase is not often diagnosed. The majority of acute-phase infections are not diagnosed because many people develop nonspecific symptoms, and the people who get the infection usually are very poor, have primitive living conditions, and no access to medical care. Unfortunately, if Chagas disease is not diagnosed and treated in the early phase, those infections that progress to chronic phase are then are diagnosed in this later stage when they are not easily treated because the damage to the body organs is usually irreversible. There are multiple types of blood tests available to test for Chagas disease. Most are based on the host (human) production of antibodies directed against the infecting parasites, although direct microscopic examination of blood smears may visualize the parasites. However, microscopic visualization of the parasites usually requires confirmation by immunological studies because visually, the parasites may be confused with those seen in people with malaria, leishmaniasis, babesiosis, giardiasis, or African sleeping sickness. Microscopic preparation and examination should be performed by experienced lab technicians or experts in parasitology. In the U.S., the FDA approved an immunologic test (enzyme-linked immunosorbent assay or ELISA test) for Chagas disease by Ortho-Clinical Diagnostics in 2006. It detects antibodies formed against T. cruzi with high sensitivity and specificity and currently is the only FDA-approved test. Since 2007, about 800 blood-donor samples have been detected as Chagas-positive across the U.S. (see map, reference five). Other tests used in other countries (indirect immunofluorescence, hemagglutination) are less sensitive and specific but are still used. A Chagas radioimmune precipitation assay (Chagas RIPA) is used in research and with FDA permission in some clinical testing but is not widely available. Most cases of Chagas disease are diagnosed when individuals donate blood; most people are not aware they have been infected with T. cruzi. However, since blood and organ donation can pass the disease to other people, most labs now test donated blood and organs for Chagas disease with the approved ELISA assay. If the donors are positive, they are notified (diagnosed). The prevalence of Chagas-positive blood donors is estimated by various studies to widely range between about one positive case per 2,000-29,000 donors. Chronic-phase Chagas disease is diagnosed also with the above-mentioned blood tests, but these patients also often have physical findings that indicate the patient has chronic disease. Physical findings may include swelling of the extremities (peripheral edema), ascites, pulmonary congestion, and arrhythmias in patients with heart involvement. Patients with mainly chronic gastrointestinal involvement may have weight loss, severe gastroesophageal reflux, esophageal erosions, inability to swallow normally, or an enlarged colon (megacolon) with an enlarged abdomen. Many different diseases can cause these physical findings so it is important to know that the patient has a positive blood test for T. cruzi before concluding the person has Chagas disease. Conversely, if such physical findings and history of possible contact with Chagas vectors is present, then the blood tests could be done to either prove or rule out the diagnosis of Chagas disease in chronic phase. Other tests such as electrocardiography and Holter or heart-event monitoring, endoscopy, esophageal manometry (pressure measurements within the esophagus), or gastrointestinal motility studies are used to help determine the functionality of heart or gastrointestinal tissues in patients with chronic-phase Chagas disease. Treatment for Chagas disease often depends on the phase of the disease and the age of the patient. Acute-phase treatment centers on killing the T. cruzi parasites with antiparasitic drugs. The prescription medications benznidazole (Rochagan, Ragonil) and nifurtimox (Lampit) may eliminate or reduce the number of parasites in the body. Some investigators suggest that drug-resistant parasites occur and others suggest these drugs of choice never eliminate all of the parasites. However, the CDC recommends drug treatment for "all people diagnosed with an acute (Chagas) infection, congenital infection, and for those with suppressed immune systems, and for all children with chronic infection. Adults with chronic infection may also benefit from treatment." The CDC advises caution about treating adults over 50 years of age and recommends that treatment plans for older adults be individualized. Both of these antiparasitic drugs are available in Central and South America. In the United States, however, the drugs can be obtained only through the CDC. During the intermediate or indeterminate phase, the vast majority of adult patients obtain no antiparasitic treatments; however, children in this stage of disease should continue drug therapy. The situation with adults may change as new investigations with antiparasitic drug treatments are being done in South America. Antiparasitic drug therapy of the chronic phase in adults is controversial. As quoted above, the CDC says adults with chronic infection may benefit from drug treatment, but most experts suggest there is no benefit to adults with chronic-phase Chagas disease. However, treatment of the symptoms of chronic Chagas disease is often necessary and can be life-prolonging or lifesaving. For example, pacemaker placement or even cardiac transplantation can be lifesaving to some patients who develop arrhythmias or cardiomyopathy. Surgical resection of the gastrointestinal tract may help alleviate some gastrointestinal problems. In addition, there are many medications available to treat specific arrhythmias and other bowel problems that may be seen in chronic Chagas disease; cardiac and gastrointestinal consultants often can help manage chronic-phase Chagas disease. Medication for the treatment of Chagas disease is available only through the CDC. Although most acute-phase infections usually do not require specialists, often patients with chronic-phase Chagas disease may benefit from consultation with a cardiologist, gastroenterologist, and/or an infectious-disease specialist. Some patients may need a transplant surgeon. The physician team members are usually made up of physicians that are experts required according to the severity of each individual's chronic problems. Currently, there is no vaccine available for humans to prevent Chagas disease. However, there are other ways available to humans to reduce or even prevent the disease. Most experts in Chagas disease agree that a majority of infections can be prevented by improving poor or primitive housing conditions. Judicious use of insecticides and education of people about home cleanliness for populations at risk for Chagas disease can augment good housing design. The principal goal is to prevent the vector (bugs) from establishing a domiciliary cycle in the home by making a home difficult for the bugs to invade or live in. For example, plaster-sealed walls in a home with a metal or shingle roof are far less likely to be populated by bug vectors than a mud-walled structure covered with a thatch roof, and a well-cleaned home is far less likely to have areas for bugs to hide and replicate than an unclean home. Several studies suggest this is an effective way to prevent Chagas disease. In addition, insect repellents and insecticides like Pyrethrin may reduce the chance of getting the disease by repelling or killing the vectors. Since blood transfusions can account for a large number of person-to-person transfers of T. cruzi, many blood banks around the world are now testing donated blood for antibodies to the parasite. If a blood sample is positive, the blood is discarded and the donor usually is notified and requested not to donate blood in the future. Similar situations occur with organ donors. Such methods help prevent Chagas disease. In general, the prognosis for people who do not develop the chronic phase of Chagas disease is usually good. People who are diagnosed and treated in the acute phase of the disease usually have an excellent prognosis. However, individuals who go on to develop chronic-phase Chagas disease have a worse prognosis due to the damage caused to the heart, GI tract, and possibly other organs. Most of the complications that develop with Chagas disease are seen in the chronic phase of the disease. Most of the complications are related to muscle changes (muscle atrophy, fibrosis, and inflammation) caused by the parasites in two body organs, the heart, and the GI tract. Consequently, heart failure and esophageal and colon enlargement (megaesophagus and megacolon) are serious complications of Chagas disease. These changes can result in weakness, difficulty swallowing, abdominal pain, and death. Other organs may also malfunction (ureters, bile duct, for example). Research is progressing on Chagas disease. The BENEFIT study plans to determine if 60 days of treatment with an antiparasitic drug (benznidazole) could prevent the progression of cardiac disease in patients with chronic Chagas disease (18-75 years of age). Another study on benznidazole is in progress to determine how well it performs in children (2-12 years of age) in prevention of deaths and complications in young adults. Researchers continue to search for a vaccine against Chagas disease; one group reports success in protecting mice with inactivated mutant parasites, while another group reports development of a vaccine made from parasite DNA. Aggressive research may provide ways to treat and prevent Chagas disease. However, a few researchers say all that is really necessary is to prevent primitive housing that leads to development of the domiciliary cycle. Hotez, P.J., E. Dumonteil, L. Woc-Colburn, J.A. Serpa, S. Bezek, et al. "Chagas Disease: The New HIV/AIDS of the Americas." PLoS Negl Trop Dis 6.5 (2012): e1498. Kirchhoff, Louis. "Chagas Disease (American Trypanosomiasis)." Medscape.com. Nov. 10, 2014. <http://emedicine.medscape.com/article/214581-overview>. "Mexico Distribution Map for Chagas' Disease." Insects, Disease, and History. <http://entomology.montana.edu/historybug/gallery/chagas_map_mexico.htm>. Odero, Randy O. "African Trypanosomiasis Treatment & Medication." Medscape.com. Dec. 2, 2015. <http://emedicine.medscape.com/article/228613-treatment>. Salazar, R., R. Castillo-Neyra, A.W. Tustin, et al. "Bed Bugs (Cimex lectularius) as Vectors of Trypanosoma cruzi." Am J Trop Med Hyg 17 (2014). "South America Distribution Map for Chagas' Disease." Insects, Disease, and History. <http://entomology.montana.edu/historybug/gallery/chagas_map_sa.htm>. United States. Centers for Disease Control and Prevention. "Parasites - American Trypanosomiasis (also known as Chagas Disease)." Dec. 19, 2017. <https://www.cdc.gov/parasites/chagas/gen_info/detailed.html>.